500 in stock Need More ? 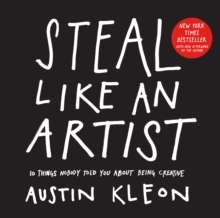 16 cm 140 p. : ill.
Now Kleon has expanded his original manifesto into an illustrated guide to the creative life for writers, artists, entrepreneurs, designers, photographers, musicians, and anyone attempting to make things - art, a career, a life - in the digital age. Brief, direct, and visually interactive, the book includes illustrative anecdotes and mini-exercise sections calling out practical actions readers can take to unleash their own creative spirits.